Looking back, the landscapes of my journey are reduced to pure colour. Austria was frozen white, Slovakia scorched ochre brown, the Hungarian Plain the yellow of rushes and the blue of a cloudless sky. 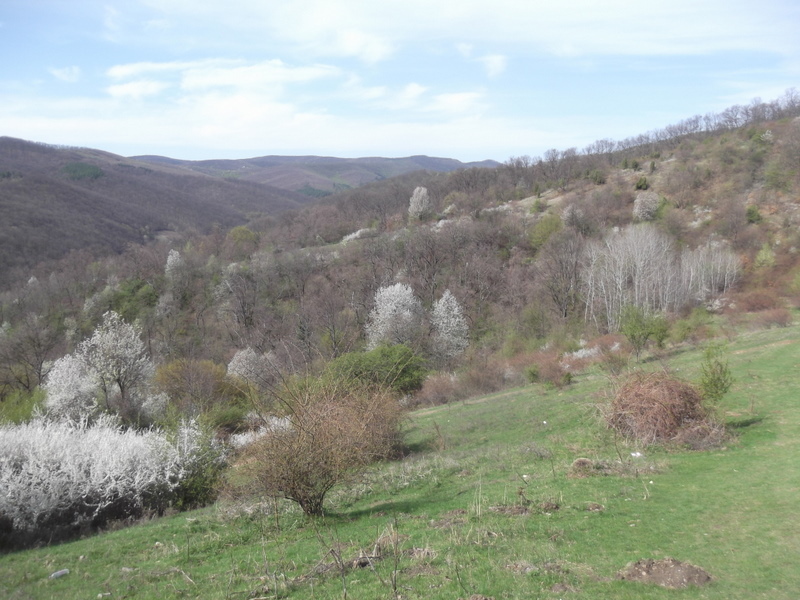 Two weeks walk across the border, and Romania has flooded my mind as the green of unfolding leaves, the explosive white of blossom, and the dense, mysterious blue of the distant Carpathian Mountains. Water suddenly fills the land – in puddles, leaves and village wells, in swollen rivers, and falling from the sky. Following the Mureș River into Transylvania, through villages of red-tiled roofs and houses peeling to reveal walls of crumbling wattle and daub, filling my bottle with buckets from wells and my hip-flask with powerful homemade țuică, I feel like I’ve entered a land of enormous natural wealth. Away from the highways – made perilous by Turkish truck-drivers racing for the border – the smaller roads are practically deserted, the traffic slowed by potholes, dogs and clattering horse-drawn carts. Walking feels more natural here, and people express less surprise when I tell them that’s how I’m travelling. Camping, too, feels easier. It may be the illusion of a foreigner, but I get the impression that this sort of thing isn’t so much minded here. The rules are looser, the land less bound. It’s a wilder country. A deep consciousness of this wildness exists in many of the Romanians I’ve met. They tell me happily that their country has the largest population of wolves and bears in Europe. (Deeper into the mountains, this might cause me to retract that comment about camping being easier here.) They are extremely proud of the fact that much food is produced in traditional ways, by people maintaining a peasant culture. Milk is often unpasteurised, and homemade cheese and butter are served in shapeless cloud-like lumps. Many families produce their own țuică from homegrown plums, apples and pears, as well as thick greenish wine that tastes different in every home. People from towns still drive to the countryside to fill carloads of bottles with mineral water from natural springs rising in the hills. Village households slaughter their own pigs, a winter tradition that provides the family with meat and fat for the long months of cold. Shepherds maintain the ancient practice of transhumanța, living with their flocks in the mountains and leading them down to the valleys for winter – something that people speak of almost as an ideology, of living with a deep understanding of nature, solitude and freedom, a tradition of pastoralism that goes back to the Dacians. The Dacian culture, which ruled this land before the first century AD, is another source of pride. The ruins of their cities reveal an advanced civilisation, with temples, highly-skilled metalwork and even running water. (Unfortunately they also had vast amounts of gold, prompting a massive Roman invasion that annihilated the culture. This resource curse is still evident today – the inhabitants of Roșia Montană are struggling to fight off a Canadian mining corporation that plans to dynamite the mountain and extract its gold with a devastating process that uses forty tonnes of cyanide a day.) The Dacians rode into battle under the standard of a snarling wolf’s-head, trailing a tube-shaped length of fabric that produced an unearthly howling as they charged. Contemporary myths said that their warriors underwent the ritual of lycanthropy – transforming themselves into wolves – which may explain local werewolf legends. I wonder if it could also explain the enormous number of stray dogs that are a part of everyday life here, existing as some collective consciousness of Dacian wolf-culture. Probably not, but as a walker I’m completely exposed to these things, and negotiating through mangy packs staking a territorial claim to rubbish dumps or abandoned buildings – as well as the enormous woolly sheepdogs that look like canine incarnations of sheep, sheep-demons protecting their flocks – it’s more fun to think so. Modern enthusiasm for Dacian culture is rooted in nationalism, especially in Transylvania, where Romanians and Hungarians both claim precedence. The Romanian national narrative depends upon an unbroken lineage stretching back to pre-Roman times – the Hungarian version basically argues that the Dacians and Romanians are unrelated, and that the Magyars got here first. History resonates in everyday life. It’s hard to escape it here. Stoned around a campfire by the Mureș, melting lumps of white pig fat on green branches over the flames, the people I was staying with – a young, modern-minded crowd into eco-friendly living and drum ‘n’ bass – enthused about ancient Dacia for hours. ‘The Dacians were strong, free, independent people with everything they wanted… mountains, rivers, a beautiful country, salt, gold, natural wealth. Then the Romans came and stole it all…’ It was an uncanny echo of the wild-eyed man I met four months ago on a rainy day by the Rhine, who spoke of the freedom of Germanic tribes before Roman oppression. It’s a kind of hippy nationalism, a mythologised affinity with suppressed ancient cultures. Both visions of history are undoubtedly simplified and romanticised, but they speak of a similar longing for a long-lost age of greater freedoms, unbound by rules. In Romania, this hippy nationalism dovetails with deep suspicion of the EU. People mutter darkly about legislation to ban homemade alcohol, restrict the use of traditional medicines, crack down on cottage industries producing local cheese and milk. There is particular scorn for new rules requiring pigs to be sent for slaughter in approved abattoirs, to be killed with electricity, rather than as a once-yearly celebration that involves the whole community. Many seem to regard the EU almost as a new Rome – an interfering, regulating force bent on suppressing traditional culture, stifling the folk knowledge and resilience that makes life here so rich. May the EU NEVER win the battle with the pigs! Really enjoyed this. Nick has arrived in my favourite land and if the gods are with us we may meet in Cluj on Monday. We were sorry to miss you in Alba Iulia this week Much enjoyed your post. Perhaps we should all join UKIP! Good wishes for a safe journey ahead. I sincerely hope the above piece doesn’t make me sound like a UKIP supporter. In Hungary the loudest anti-EU voices came from the paranoid nationalist right, who believe it’s a shadowy socialist conspiracy to destroy their country. In Romania, the opinions I’ve heard so far seem less ideological and more complaints about regulation and bureaucracy — although of course this is ideological too. Personally I think the EU gets a lot of things wrong and a lot of things right. If it ever came down to a battle with pigs (see Anna’s comment above), I’d like to see Pigs Vs. EU but would much rather see Pigs Vs. UKIP. I’d pay good money. Well said, Nick. Keep going and may the spirits of the Dacians help you on your way! Wish I was there trotting along with you, with my big old box camera. Pigs v politicians and bureaucrats.. Wasn’t there a book about that? Nick, I’ve been following your journey from afar here in South AUstralia and congratulations on your achievements to date. A long time admirer of PLF I too am finally achieving a dream and will be travelling to Roumania this coming September. I’ll be travelling a little less authentically than you in retracing PLF’s footsteps being now a bit ancient so car and public transport for me. So looking forward to it! Good luck with the rest of your journey – you too are an amazing young man. One small observation that I can make about you mentioning those silly EU regulations, seeing how it stirred up reactions, is Romanians don’t really see them as a threat. They are the subject of jokes in the villages. We have lived through harder times and got really good at bending or breaking rules, and war can be started if they threaten our Țuica or Pălinca. through consumerism, and make it “uncool” for the young people to stay in the villages and work there with their families. There are many educated young people that think of returning to rural life, some of them actually do, but the problem is with the kids that grow up there and all they want is to get out. This is probably where the EU could help somehow, but it doesn’t. All it offers is bureaucracy and we already have that. Anyway this is a delicate subject that can lead to long discussions, and probably the mission of my generation is to actually do something about it. Like others I am greatly, if intermittently, enjoying your accounts, but this one was marvellous. 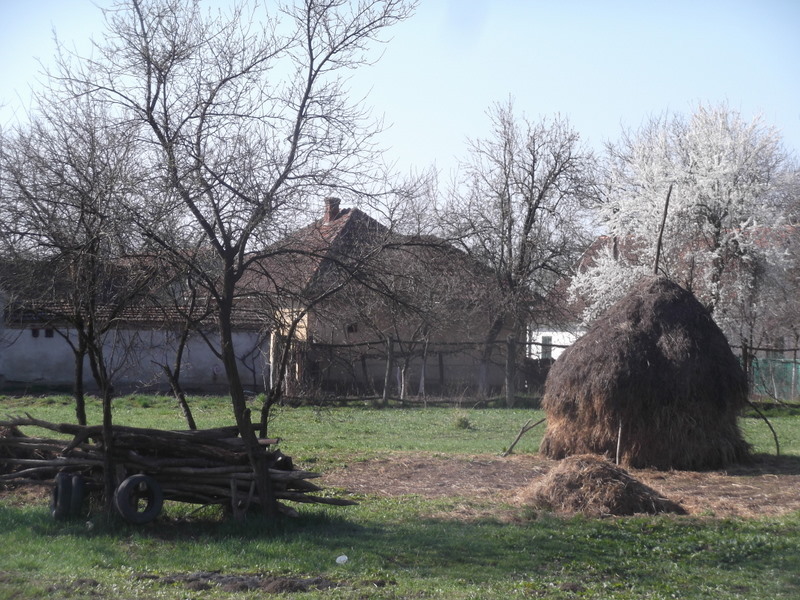 Your weaving together of present day Romania and a two-thousand-year national myth is masterly. I suspect the myth will endure longer than the lifestyle – nothing to do with the EU, simply that the grass seems greener in the gold-paved streets of a consumer society.